Kathy Slade undertook a 52-week performance, beginning in September 2006, resulting in a unique bookwork. Once a week, on an appointed day and time, she visited the Vancouver Public Library to choose and borrow a book. Each transaction receipt, which clearly states the date, time and book title, was digitally scanned and saved. Because the receipts are printed on thermal paper, they will slowly fade. At the end of the year, these documents from the performance were assembled into an artists’ book that was donated to the Vancouver Public Library Special Collections. This project is at once simple and complex. It touches on numerous on-going themes in Slade’s practice and responds to the contract of exchange between the borrowing individual and lending institution. A dossier of her movements once a week, for one year, Fifty-two Weeks is a self-portrait formed by the artist’s selection of materials to consume. This ordinarily private transaction is presented for the speculation of the viewer – did she, in fact, read the books? Was her choice influenced through the knowledge that it would be made public? Is there significance in the sequence of her list, does it contain a secondary index beyond the chronological record? How might these borrowed books have influenced her thinking, her next choice, her actions? Are her choices correct, or trivial, or pointed? Through inverting the terms of the lending policy, by disclosing what library procedures guard as private, Fifty-two Weeks draws attention to the routine and everyday negotiation of technological surveillance by individuals and by institutions. Encouraging our speculation as to her reading choices, Slade sets up an expectation that we might learn more about her by tracking her transactions. Her weekly visits, each indicating a new page, accumulate in a serial, predictable pattern of behaviour – the performed creation of a book. 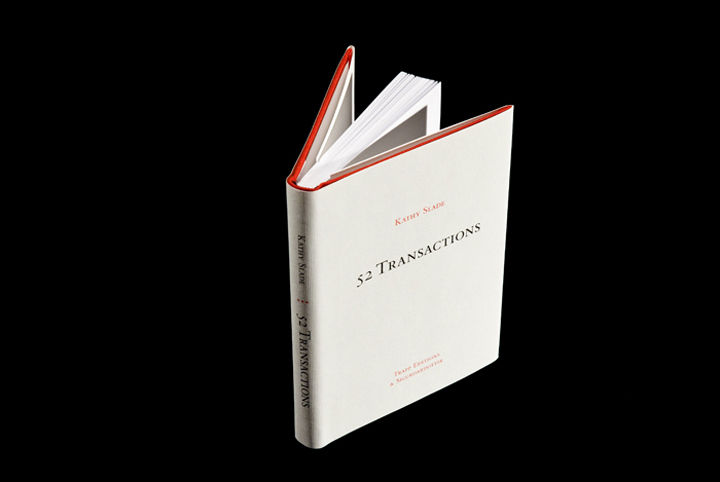 In collaboration with Trapp Editions, an offset version of the project 52 Transactions was produced and distributed internationally. Group Search was made possible through the invaluable contributions of The Canada Council for the Arts, the BC Arts Council, the Spirit of BC Arts Fund, the Vancouver Foundation, Emily Carr Institute of Art and Design and Generation Printing.